UNTIL RECENTLY, IT was quite common to hear the claim that human nature was fundamentally selfish and disconnected from the common good. The genesis of this idea—at least in modern American times—can be traced back to the publication of Atlas Shrugged, by Ayn Rand, a 1,200 page novel that advocated the unfettered pursuit of self-interest as the organizing principle for society. Despite the fact that the book became a best-seller, not many critics and intellectuals took it or its thesis seriously. Who could possibly believe that a society based strictly on selfishness could work? That skepticism was obliterated over the next several decades. One of the key blows was struck by Richard Dawkins, whose book The Selfish Gene, which appeared in1976, argued that the gene is the fundamental unit of natural selection and has only one imperative: successfully reproducing itself in competition with other genes. We (and other animals), as bearers of these “selfish” genes, will therefore carry those traits—and only those traits—that help these genes reproduce. Dawkins implied that this was all you needed to know to understand human nature, and the idea quickly led to an explosion of selfish gene-based explanations for every aspect of human behavior. Then, in 1980, Milton Friedman, with his wife, Rose, published Free to Choose, a no-holds-barred polemic in favor of self-interested individuals making “rational,” unregulated decisions against anything that interfered with this process, especially government action. So, in a powerful conjunction of economics and evolutionary biology, Ayn Rand’s glorification of selfishness gained the imprimatur of serious science. Being selfish was just human nature and should not be fought. Indeed, any attempt to do so was bound to do more harm than good. Thus was the original reaction to Atlas Shrugged turned on its head. Who could possibly believe that a society based on anything other than selfishness could work? No doubt Ayn Rand would have been delighted with the progress of her big idea in the subsequent decade. Ronald Reagan was elected president and Margaret Thatcher became Prime Minister of the United Kingdom. Both preached a politics best summarized as “government is the problem, not the solution,” and both preached an economic gospel that glorified the individual pursuit of wealth above all else. And Rand’s disciple, Alan Greenspan, was appointed head of the Federal Reserve in 1987 and remained there for nineteen years, treated reverently by Democratic and Republican administrations alike. Also in this decade, the breakdown of the postwar welfare states became undeniable. Meanwhile, the Soviet Union and other “socialist” countries ignominiously collapsed. Conservatives argued that all this was real world confirmation of Rand’s core idea: those who interfered with human selfishness would reap the whirlwind. The selfless gene (or, more likely, genes) allowed our ancestors to think and to act as a group, thereby outcompeting other chimp-like species—literally leaving them in the dust. Moreover, our cooperative nature allowed us to build ever more complex ways of interacting with one another, which led to further evolution of the traits that facilitate cooperation (referred to as “gene-culture coevolution”). The end result of this dynamic was civilization and, eventually, the globally interconnected society we live in today. According to this view of human nature, we are defined by our sense of fairness, adherence to group norms, willingness to punish those who violate such norms, and to share and work for the good of the group. We are not a species of seven billion selfish individuals, uninterested in anything save our own welfare and willing to cheerfully break any rule and hurt any other individual to secure it. Indeed, we think of such people as sociopaths, and if their tendencies actually dominated humanity we would still be back on the savannah with the rest of the chimp-like species. This view, as it becomes more widely accepted and understood, should have enormous significance for economics, politics, and a wide range of public policy challenges. But you wouldn’t guess it from the reaction of the political left. Despite the obvious ways in which these insights should bolster the liberal quest for fairness and social justice, they have not been embraced by liberal intellectuals. Part of this has to do with the allergy on the left to any attempt to craft a biological theory of human nature. Such attempts are associated with Social Darwinism or, worse, rationales for eugenics or violence against women. This was the reaction to the emergence of “sociobiology” in the late 1970s; leftist demonstrators at Harvard went so far as to douse sociobiology’s leading exponent, E.O. Wilson, with ice water as they shouted “Wilson, you’re all wet.” Feelings do not run so high today, but views on the left remain distinctly unenthusiastic about biological theorizing on human nature. Perhaps it is time for the left to discard these prejudices. Wilson himself has undergone a conversion of sorts recently and now argues strongly for the new view of human evolution based on group cooperation (as in his new book, The Social Conquest of Earth). But if that is not enough for those on the left, they should look at A Cooperative Species: Human Reciprocity and Its Evolution by two economists with impeccable liberal credentials. First, people cooperate not only for self-interested reasons but also because they are genuinely concerned about the well-being of others, try to uphold social norms, and value behaving ethically for its own sake. People punish those who exploit the cooperative behavior of others for the same reasons. Contributing to the success of a joint project for the benefit of one’s group, even at a personal cost, evokes feelings of satisfaction, pride, even elation. Failing to do so is often a source of shame or guilt. Second, we came to have these “moral sentiments” because our ancestors lived in environments, both natural and socially constructed, in which groups of individuals who were predisposed to cooperate and uphold ethical norms tended to survive and expand relative to other groups, therefore allowing these prosocial motivations to proliferate. The first proposition concerns proximate motivations for prosocial behavior, the second addresses the distant evolutionary origins of ongoing perpetuation of these cooperative dispositions. The book’s great achievement is that it provides the most rigorous statement yet of the case for these two propositions. It opens by acquainting the reader with the wide range of experimental evidence showing that people act more altruistically toward strangers than would be predicted by standard economic and evolutionary theory. In a game called the “dictator game,” one of two players, the “proposer,” is given a sum of money and asked to give some amount to the second player. The proposer is allowed to keep the rest and there is no second round. A truly rational decision-maker would give the second player nothing. But in actual experimental situations, a majority of proposers give positive amounts, ranging from 20 to 60 percent of the whole. In another game, the “ultimatum game,” there is a responder and a proposer and, again, the proposer has a certain amount of money to dispose of. The proposer offers some portion of that money to the responder, who may accept or reject the offer. If accepted, the players get to keep the money, as divided by the proposer. If rejected, neither player gets anything. The truly rational self-regarding proposer would offer the least possible amount—say, a dollar—and the truly rational responder would accept the offer, since he realizes that otherwise he will get nothing. But that’s not what happens. In experiments conducted around the world, the vast majority of players offer between 40 and 60 percent of the total amount, with offers below 30 percent routinely rejected by responders. People act a great deal more fairly than purely selfish individuals would. These “social preferences” undergird our ability to cooperate with one another in groups that go far beyond our immediate family: we want to do the right thing. If we did not have these social preferences, cooperation with strangers on the scale practiced by human beings would fall apart. But where did these social preferences come from? Are they truly altruistic, or just concealed efforts to follow our own self-interest? The book is an excellent primer on how biologists have sought to explain seemingly altruistic behaviors in terms of self-interest. The most important of these is kin selection: other-regarding behaviors simply reflect a drive to help those with whom you share your genes. Thus the famous remark by biologist J.B.S. Haldane who, when asked if he would give his life to save a drowning brother, said, “No, but I would to save two brothers or eight cousins.” (He would share 50 percent of his genes with a brother but only 12.5 percent with a cousin.) So altruistic behavior may occur, but it is motivated by the self-interested payoff of reproducing our own genes through helping close kin. The other explanation is termed reciprocal altruism. The idea here is simple: you scratch my back, I scratch yours. Thus animals, including human beings, may help one another out at some cost to themselves but it will always be in expectation of some future payoff. Bowles and Gintis are fully in agreement that these two explanations play a huge role in explaining seemingly altruistic behaviors in many species. But they demonstrate that these explanations cannot plausibly account for the wide range of human cooperative behaviors that they document. Bowles’s and Gintis’s favored explanation builds on long-accepted concepts in evolutionary biology that go back to the theories of William Hamilton and George Price. (The role of Price, one of the most unusual characters in the history of science, and the whole debate over altruism, is wonderfully covered in Oren Harman’s The Price of Altruism.) Briefly, these theories establish that altruistic behaviors can be selected for on different levels (“multi-level selection”), including that of the group, provided certain conditions are met. In the case of the group, that means that the fitness effects from altruistic behavior at the level of the group (positive, because your group can survive better particularly in competition with other groups) must outweigh the fitness effects at the level of the individual (negative, because the individual is incurring costs to help the group and will likely be taken advantage of by those not inclined toward altruism). Until recently, biologists have thought that such conditions cannot be met in plausible evolutionary circumstances and that therefore group selection is so unlikely it should be ignored. 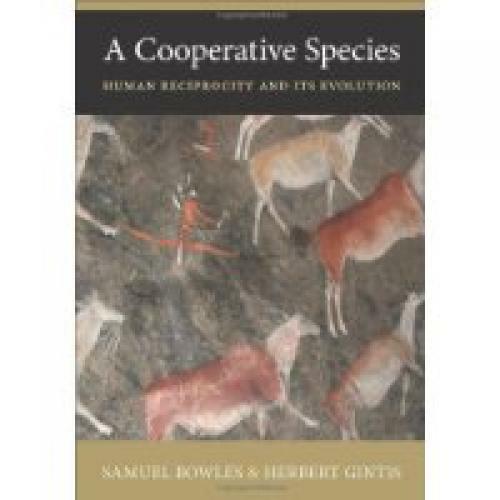 Bowles and Gintis spend the bulk of their book showing that, in fact, group selection for altruistic behaviors is plausible under conditions that resemble our evolutionary past and that, moreover, only this type of selection can account for the observed cooperative behaviors and norms that undergird human society at all levels of development. The mechanisms that make this basic story work are complicated and Bowles and Gintis go to considerable lengths to explain these mechanisms. We learn much, for example, about the critical role of norms and cultural institutions in punishing non-cooperators and enforcing altruistic behaviors. Thus our capacity to form these norms and institutions and promulgate them over time—unique to human beings—helps to explain how altruism could survive and spread within groups. There is also considerable discussion about what circumstances might promote between-group selection. For group selection to play a big role, selection pressures favoring groups with altruists should be strong. These pressures could certainly include coping with resource constraints and sudden climactic events, but Bowles and Gintis believe warfare between groups played a key, and perhaps central, role. This is an unpleasant thought, but they make a convincing case that our capacity for cooperation owes much to the benefits reaped by altruist-heavy tribes from exterminating tribes where selfish behavior predominated. Some of Bowles’s and Gintis’s case is based on a close reading of the archeological and anthropological record. But—and this will unfortunately limit its readership—much of it is based on evolutionary game theory and agent-based modeling. They attempt to summarize findings as they go along and some of the densest math is relegated to appendices. But there are still plenty of equations in the text and, by and large, the prose is quite academic, if fairly clear given the detail in which they discuss their models and theories. This means that the lay reader will be forced to skip some sections, reading ahead to summaries and skipping most if not all of the equations. Despite this drawback, I recommend the book for those wishing to really understand the logic and evidence for this theory of human nature. Actually-existing human beings turn out to be not so bad after all, and this should be cause for celebration.